During one of my seed catalogue grand purchases I bought some seeds of Echinacea. They germinated, grew on, were planted, and didn't do anything. Then the following summer - hey presto! Long stems appeared, topped with the most beautiful old-rose pink daisy flowers. I've planted several clumps down the water race - they provide great flower competition for the white Shasta daisies. The weeks immediately after mid-summer can be scruffy and oddly colour-free, and Echinacea fill this down-time in the garden perfectly. And the bees absolutely adore them. 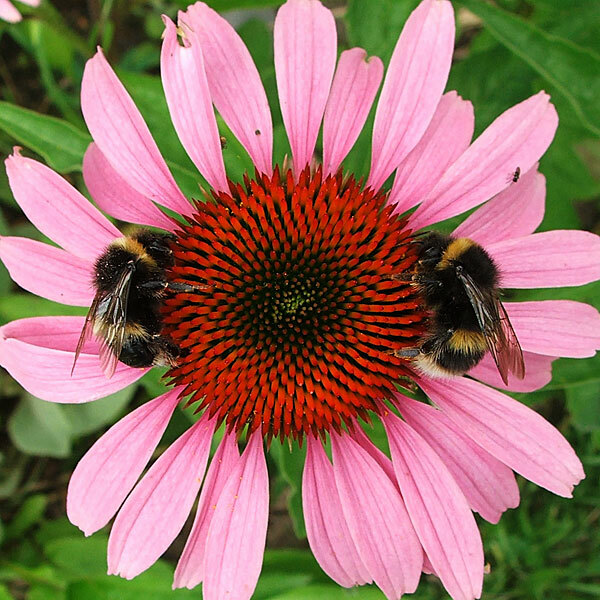 Echinacea are commonly called 'Coneflowers', and are used in herbal medicine. Some farmers grow them as a crop - imagine the beauty of a field full of Echinacea flowers! It must be at least six weeks since my Echinacea plants started flowering. And - you guessed it - they're still flowering! We are friends for life. I'm going to grow some different colours from seed.